While Away House Sitters & Pet Care Inc. has more than nineteen years of experience in the house sitting and pet care industry. Our caregivers are hand selected based on their unwavering passion for animals, their high level of accountability and their willingness to go above and beyond for our clients. While Away was established in 1999 and has grown one client at a time. We currently serve over 1500 customers in Calgary and surrounding areas (Airdrie, Cochrane, Bragg Creek and Springbank) and look forward to assisting more in the future.While Away is fully licensed, insured and bonded. All caregivers have completed a criminal record check and vigorous interview process. While Away is also a member of the Better Business Bureau (BBB) where we have an A+ rating for the outstanding service we provide to our clients. Our mission is to be an integral part of our community by encouraging donations to rescues and other non-profit organizations, by promoting the fostering and rescuing of animals in need, and by providing exceptional home and pet care for our valuable friends. We want to be part of the solution to spread a message of giving, service, gratitude and animal love and protection. 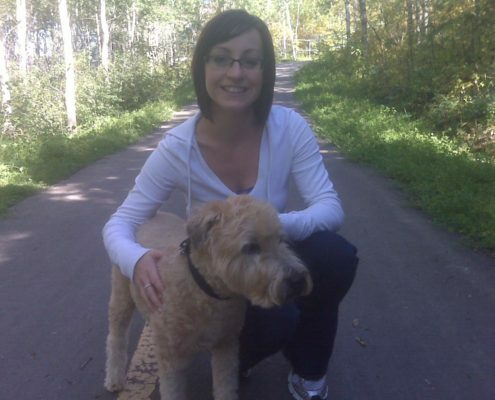 Mandy’s love for animals began when she was a young girl as she was raised on a farm in southeast Saskatchewan. She is the youngest in a family of 6 and spent a lot of time growing up being the “only child” at home so she quickly learned to make friends with her little critters on the farm. It wouldn’t be unusual to see her kittens dressed up in doll clothes or wrapped up in blankets. While other friends hung posters of celebrity crushes on their walls and read People magazine, she displayed drawings of horses and read about life’s fascinating creatures. Mandy received a Marketing Management certificate from the British Columbia Institute of Technology in May of 2009. Shortly after completing her studies, she moved from Vancouver to Calgary. She was ready for a change and has always been interested in this beautiful city. Once in Calgary, she began working for While Away under the previous owner. When she heard that the company was for sale, she took advantage of the opportunity to continue on its legacy. She realized that While Away is a great business where she is able to help other people by doing what she truly loves to do. Sandra has been with While Away since 2000, making her our longest-serving employee! 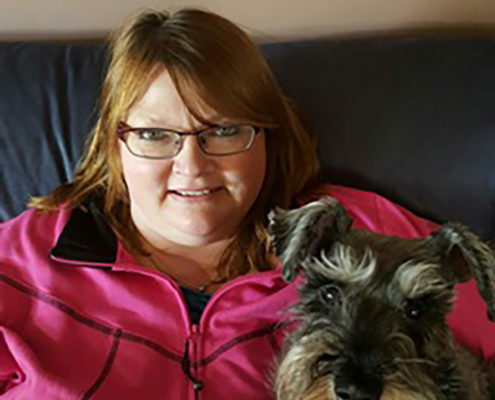 She works in Woodlands & surrounding communities, and also boards small caged pets.Sandra has a huge love for animals, and treats each pet she looks after as if it were her own. 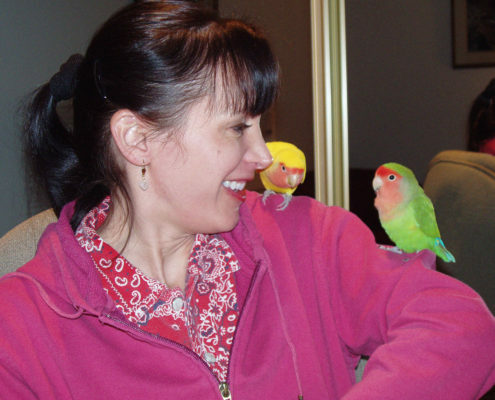 She has owned a variety of pets over the years & so has personal experience with dogs, cats, rabbits, mice, budgies, cockatiels, hermit crabs and aquariums. Sandra is currently the proud owner of a goldfish and two cats: Katie, a pure white beauty, and Lennie, an independent-minded tabby. Her areas of expertise are cats and exotic pets. Her gentle personality has made her a favourite visitor of even the most timid pets. She is also known for her skilled care of houseplants. Shelby grew up on a farm about an hour east of the city and has always been surrounded by animals. They have always been more than just pets but are a part of her family as well. She currently has one dog named Harvey, a little tiny Maltese Yorkie with the biggest personality as well as one cat that she rescued a couple of years ago named Snowball. They are two of her very best friends and she can relate to you because she knows how much she misses them when she’s away! This is why she loves working for While Away so much. It feels like the farthest thing from a job. Being able to hang out with pets and get to know each of their personalities is one of the best parts of the job and she feels so lucky that she gets to do it everyday! Cora is from a small town in Saskatchewan and has recently decided to leave the city to return to the small town feel in High River. 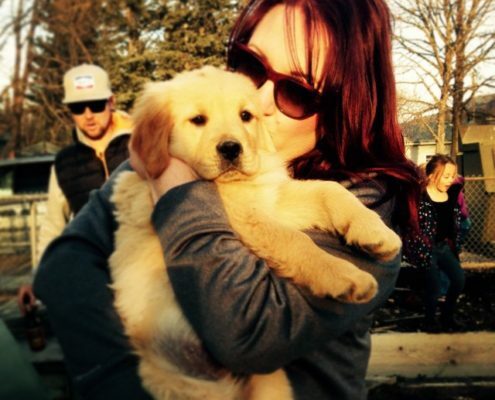 She has always had a passion for animals which gives her a much welcomed break from her accounting career. 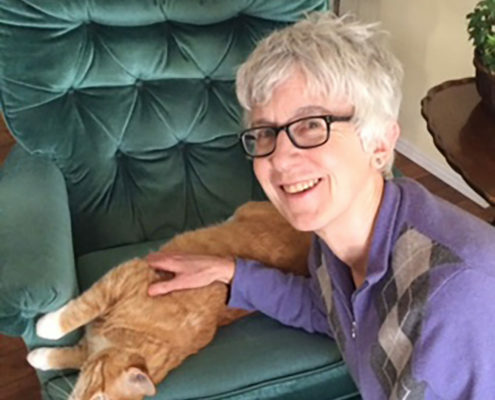 Her 2 cats, Maya and Mitzi, are her pride and joy so she understands that a “pet” is not so much a pet; rather a member of the family! Cora has worked for While Away for a few years now and loves getting to know her clients and their special family members. Karen has been with While Away for more than eight years now. She does amazing work with While Away and finds her time spent with our furry ones very rewarding. She grew up on a dairy farm in a small town in Manitoba and has been around animals her whole life. She enjoys getting to know each member of our furry family and learning about their unique personalities. 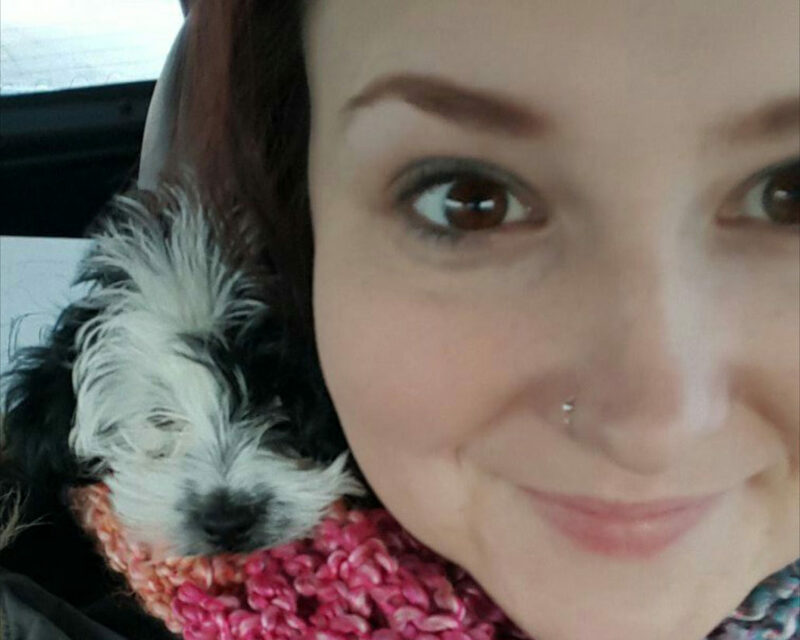 With While Away, two teenage kids and a mini schnauzer named Zack, Karen sure has her hands full! Mary has worked with While Away since August of 2014. She really enjoys caring for our furry ones and enabling them to feel safe at home while their people are away. She has looked after numerous cats, dogs of all sizes, rabbits, fish and even lizards! Mary is retired from her previous career and is able to be there during the day with our furry families. She loves her work with While Away! 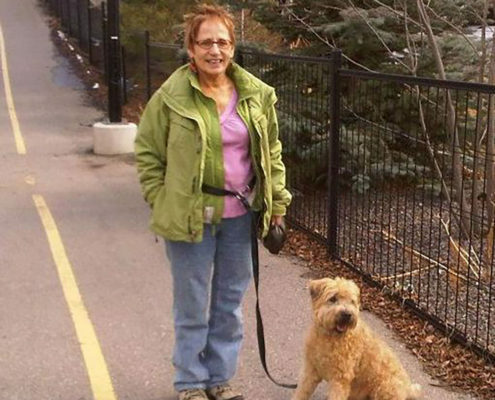 Sue grew up with a Labrador and a German shorthair pointer. 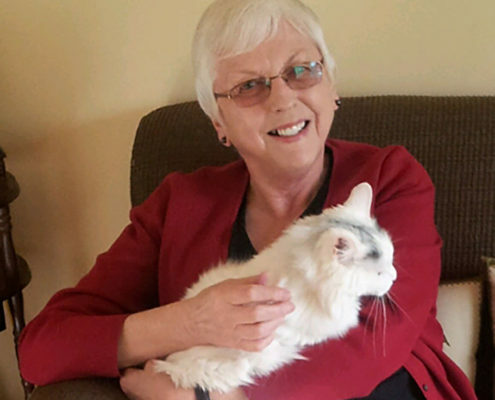 She has always liked the lovableness of big dogs, but in her later years has developed and appreciation for cats as well, which she currently is the proud mother of to two. She retired from the medical field and started working at While Away. Sue has come to love the chutzpah of little dogs as well!